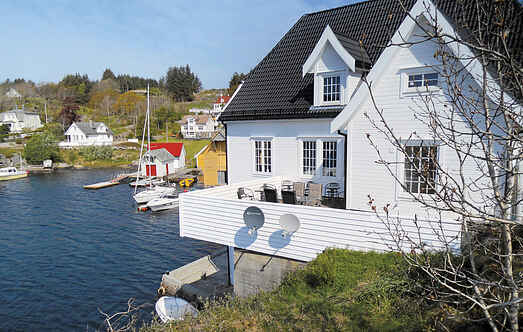 Find a vacation home to rent in Sund Municipality from our list of vacation rental properties. Campaya has over 6 vacation homes available in Sund Municipality, which give you the possibility to locate a unique accommodation in Sund Municipality which completes your check-list in search for the perfect self catering vacation apartments in Sund Municipality or vacation villas in Sund Municipality. This attractive holiday apartment is located right on the waterfront with panoramic views across the sea. The apartment is on the 2nd floor with a sun-soaked terrace facing west. Beautiful holiday home at Forlandsvågen in Sund, with an idyllic location by the fjord. This beautiful apartment is located right on the waterfront and offers panoramic views of the fjord and the sea. Charming holiday home placed by its own on the little island Lerøy. Here you can enjoy relaxing days surrounded by beautiful nature and with a great view to both fjord and mountains. Welcome to a well equipped holiday home with high standard, beautifully placed directly to the fjord. Large terrace with good outdoor furniture and jacuzzi by the water.